The 2001 anthrax attacks remain one of the great mysteries of the post-9/11 era. After 9/11 itself, the anthrax attacks were probably the most consequential event of the Bush presidency. One could make a persuasive case that they were actually more consequential. The 9/11 attacks were obviously traumatic for the country, but in the absence of the anthrax attacks, 9/11 could easily have been perceived as a single, isolated event. It was really the anthrax letters — with the first one sent on September 18, just one week after 9/11 — that severely ratcheted up the fear levels and created the climate that would dominate in this country for the next several years after. It was anthrax — sent directly into the heart of the country’s elite political and media institutions, to then-Senate Majority Leader Tom Daschle (D-SD), Sen. Pat Leahy (D-Vt), NBC News anchor Tom Brokow, and other leading media outlets — that created the impression that social order itself was genuinely threatened by Islamic radicalism. By design, those attacks put the American population into a state of intense fear of Islamic terrorism, far more than the 9/11 attacks alone could have accomplished. Much more important than the general attempt to link the anthrax to Islamic terrorists, there was a specific intent — indispensably aided by ABC News — to link the anthrax attacks to Iraq and Saddam Hussein. In my view, and I’ve written about this several times and in great detail to no avail, the role played by ABC News in this episode is the single greatest, unresolved media scandal of this decade. News of Ivins’ suicide, which means (presumably) that the anthrax attacks originated from Ft. Detrick, adds critical new facts and heightens how scandalous ABC News’ conduct continues to be in this matter. ABC News’ claim — which they said came at first from “three well-placed but separate sources,” followed by “four well-placed and separate sources” — was completely false from the beginning. There never was any bentonite detected in the anthrax (a fact ABC News acknowledged for the first time in 2007 only as a result of my badgering them about this issue). It’s critical to note that it isn’t the case that preliminary tests really did detect bentonite and then subsequent tests found there was none. No tests ever found or even suggested the presence bentonite. The claim was just concocted from the start. It just never happened. And despite continued White House denials, four well-placed and separate sources have told ABC News that initial tests on the anthrax by the US Army at Fort Detrick, Maryland, have detected trace amounts of the chemical additives bentonite and silica. The discovery of bentonite came in an urgent series of tests conducted at Fort Detrick, Maryland, and elsewhere. Clearly, Ross’ allegedly four separate sources had to have some specific knowledge of the tests conducted and, if they were really “well-placed,” one would presume that meant they had some connection to the laboratory where the tests were conducted — Ft. Detrick. That means that the same Government lab where the anthrax attacks themselves came from was the same place where the false reports originated that blamed those attacks on Iraq. It’s extremely possible — one could say highly likely — that the same people responsible for perpetrating the attacks were the ones who fed the false reports to the public, through ABC News, that Saddam was behind them. What we know for certain — as a result of the letters accompanying the anthrax — is that whoever perpetrated the attacks wanted the public to believe they were sent by foreign Muslims. Feeding claims to ABC designed to link Saddam to those attacks would, for obvious reasons, promote the goal of the anthrax attacker(s). This news about bentonite as the additive being a trademark of the Iraqi biological weapons program is very significant. Partly because there’s been a lot of pressure on the Bush administration inside and out to go after Saddam Hussein. And some are going to be quick to pick up on this as a smoking gun. On the critical issue of who sent the anthrax, it’s time to give credit to the ABC website, ABCNews.com, for reporting rings around most other news organizations. Here’s a bit from a comprehensive story filed late last week by Gary Matsumoto, lending further credence to the commonsensical theory (resisted by the White House) that al Qaeda or Iraq — and not some domestic Ted Kaczynski type — is behind the germ warfare. The Weekly Standard published a much lengthier and more dogmatic article in April, 2002 again pushing the ABC “bentonite” claims and arguing: “There is purely circumstantial though highly suggestive evidence that might seem to link Iraq with last fall’s anthrax terrorism.” The American Enterprise Institute’s Laurie Mylroie (who had an AEI article linking Saddam to 9/11 ready for publication at the AEI on September 13) expressly claimed in November, 2001 that “there is also tremendous evidence that subsequent anthrax attacks are connected to Iraq” and based that accusation almost exclusively on the report from ABC and Ross (”Mylroie: Evidence Shows Saddam Is Behind Anthrax Attacks”). The Iraqi regime has plotted to develop anthrax, and nerve gas, and nuclear weapons for over a decade. Bush’s invocation of Iraq was the only reference in the State of the Union address to the unsolved anthrax attacks. And the Iraq-anthrax connection was explicitly made by the President at a time when, as we now know, he was already eagerly planning an attack on Iraq. I’m not sure if panic is quite the right word, but it is close enough. Anthrax played a role in my decision to support the Bush administration’s desire to take out Saddam Hussein. I linked him to anthrax, which I linked to Sept. 11. I was not going to stand by and simply wait for another attack — more attacks. I was going to go to the source, Hussein, and get him before he could get us. As time went on, I became more and more questioning, but I had a hard time backing down from my initial whoop and holler for war. Anthrax. Remember anthrax? It seems no one does anymore — at least it’s never mentioned. But right after the terrorist attacks of Sept. 11, 2001, letters laced with anthrax were received at the New York Post and Tom Brokaw’s office at NBC. . . . There was ample reason to be afraid. 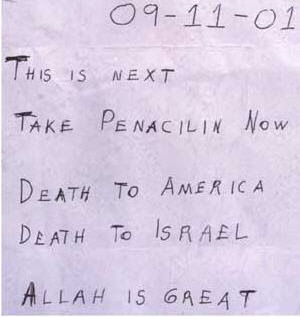 For this and other reasons, the anthrax letters appeared linked to the awful events of Sept. 11. It all seemed one and the same. Already, my impulse had been to strike back, an overwhelming urge that had, in fact, taken me by surprise on Sept. 11 itself when the first of the Twin Towers had collapsed. . . . In the following days, as the horror started to be airbrushed — no more bodies plummeting to the sidewalk — the anthrax letters started to come, some to people I knew. And I thought, No, I’m not going to sit here passively and wait for it to happen. I wanted to go to “them,” whoever “they” were, grab them by the neck, and get them before they could get us. One of “them” was Saddam Hussein. He had messed around with anthrax . . . He was a nasty little fascist, and he needed to be dealt with. That, more or less, is how I made my decision to support the war in Iraq. Cohen’s mental process that led him to link anthrax to Iraq and then to support an attack on Iraq, warped as it is, was extremely common. Having heard ABC News in the immediate aftermath of the 9/11 attack flamboyantly and repeatedly link Saddam to the anthrax attacks, followed by George Bush making the same linkage (albeit more subtly) in his January, 2002 State of the Union speech, much of the public had implanted into their minds that Saddam Hussein was not just evil, but a severe threat to the U.S., likely the primary culprit behind the anthrax attacks. All along, though, the anthrax came from a U.S. Government/Army research lab. Critically, ABC News never retracted its story (they merely noted, as they had done from the start, that the White House denied the reports). And thus, the linkage between Saddam and the anthrax attacks — every bit as false as the linkage between Saddam and the 9/11 attacks — persisted. We now know — we knew even before news of Ivins’ suicide last night, and know especially in light of it — that the anthrax attacks didn’t come from Iraq or any foreign government at all. It came from our own Government’s scientist, from the top Army bioweapons research laboratory. More significantly, the false reports linking anthrax to Iraq also came from the U.S. Government — from people with some type of significant links to the same facility responsible for the attacks themselves. Surely the question of who generated those false Iraq-anthrax reports is one of the most significant and explosive stories of the last decade. The motive to fabricate reports of bentonite and a link to Saddam is glaring. Those fabrications played some significant role — I’d argue a very major role — in propagandizing the American public to perceive of Saddam as a threat, and further, propagandized the public to believe that our country was sufficiently threatened by foreign elements that a whole series of radical policies that the neoconservatives both within and outside of the Bush administration wanted to pursue — including an attack an Iraq and a whole array of assaults on our basic constitutional framework — were justified and even necessary in order to survive. ABC News already knows the answers to these questions. They know who concocted the false bentonite story and who passed it on to them with the specific intent of having them broadcast those false claims to the world, in order to link Saddam to the anthrax attacks and — as importantly — to conceal the real culprit(s) (apparently within the U.S. government) who were behind the attacks. And yet, unbelievably, they are keeping the story to themselves, refusing to disclose who did all of this. They’re allegedly a news organization, in possession of one of the most significant news stories of the last decade, and they are concealing it from the public, even years later. They’re not protecting “sources.” The people who fed them the bentonite story aren’t “sources.” They’re fabricators and liars who purposely used ABC News to disseminate to the American public an extremely consequential and damaging falsehood. But by protecting the wrongdoers, ABC News has made itself complicit in this fraud perpetrated on the public, rather than a news organization uncovering such frauds. That is why this is one of the most extreme journalistic scandals that exists, and it deserves a lot more debate and attention than it has received thus far. UPDATE: One other fact to note here is how bizarrely inept the effort by the Bush DOJ to find the real attacker has been. Extremely suspicious behavior from Ivins — including his having found and completely cleaned anthrax traces on a co-worker’s desk at the Ft. Detrick lab without telling anyone that he did so and then offering extremely strange explanations for why — was publicly reported as early as 2004 by The LA Times (Ivins “detected an apparent anthrax leak in December 2001, at the height of the anthrax mailings investigation, but did not report it. Ivins considered the problem solved when he cleaned the affected office with bleach”). In October 2004, USA Today reported that Ivins was involved in another similar incident, in April of 2002, when Ivins performed unauthorized tests to detect the origins of more anthrax residue found at Ft. Detrick. Yet rather than having that repeated, strange behavior lead the FBI to discover that he was involved in the attacks, there was a very public effort — as Atrios notes here — to blame the attacks on Iraq and then, ultimately, to blame Stephen Hatfill. Amazingly, as Atrios notes here, very few people other than “a few crazy bloggers are even interested” in finding out what happened here and why — at least to demand that ABC News report the vital information that it already has that will shed very significant light on much of this. Actually, I do agree that this is an extra-ordinary example of corpo-media's deeply dangerous corruption making for a clear and present danger to the informed health of humanity. The right of people to think, speak, press, assemble, and seek redress of grievance must be exercised, WITHOUT strings nor advertising dollars. Erin S. Myers on Sat, 08/02/2008 - 8:03am. So, we have the questioning of Dana Mouth in the house of Whitey a couple of weeks back by Eric Brewer from Rawstory on the lack of progress and lack of interest by Shrub into the anthrax case. "The FBI has narrowed its focus to 'about four' suspects in the 6 1/2-year investigation of the deadly anthrax attacks of 2001, and at least three of those suspects are linked to the Army's bio-weapons research facility at Fort Detrick in Maryland . . . Among the pool of suspects are three scientists — a former deputy commander, a leading anthrax scientist and a microbiologist — linked to the research facility, known as USAMRIID. The FBI has collected writing samples from the three scientists in an effort to match them to the writer of anthrax-laced letters that were mailed to two U.S. senators and at least two news outlets in the fall of 2001, a law enforcement source confirmed." Someone/group is slowly releasing the pressure valve on this one. Haven't seen yet in the M$M about Jerome Hauer getting the White House to go on Cipro. "On September 11, 2001, Jerome Hauer advised the White House to begin taking Cipro. At the time, he was a national security advisor with the National Institute of Health, a managing director with Kroll Associates, and a frequent guest on national television. His background in counter-terror and his specialized knowledge of biological warfare served him well on that day. Perhaps a little too well." He was able to get his "friend" John O'Neil to take the position as head of security at WTC and start on the 11th. That's what I want to see, that angle, in the M$M stories. If you yawn long enough, you can inhale more anthrax goodies, brother Erin. "Cipro - It's not just for Dictatorial regimes anymore - Ask your doctor before taking Cipro as it may lead to suiciding in a strange roundabout way." Pixelwrangler on Sat, 08/02/2008 - 3:52pm. ... people were grabbing up the Washington Post almost with glee (big amtrax headline). "Look... look how close they got to getting the guy"
"How smart of the FBI to let everyone think they were focused on Hatfield, when clearly they were trying to sneak up on Ivans"
"Too bad they couldn't get him into custody before he off-ed himself, now well never know why he did it"
I kept my computer open to GeorgeWashington2 blog... and pointed it out for da smart-er people to consider (not many there, I suspect). I'm talking about a major bedroom "community of intelligence". I say, central intelligence is a dumb idea. Erin S. Myers on Sat, 08/02/2008 - 5:40pm.